Land of the Berbers: We think of the Libyans as Arabs, and that’s true for most, but it hides a more complicated picture. For all of recorded history, the bulk of Libya’s people have been Berbers, and that remains so today, though most of Libya’s Berbers also descend from Arabs. The Berbers were simple farmers during the Bronze Age, living in mountain and oasis villages across North Africa. The Egyptians referred to one of the Berber tribes as the “Levu,” and that’s probably the origin of the name “Libya.” Berbers from Libya actually conquered Egypt in 950 B.C.E., and the “Libyan dynasties” continued until about 730 B.C.E. Many Libyans still speak Berber languages and consider themselves Berbers first and foremost. And modern Libya includes several Berber tribes. Gaddafi’s togas aren’t just fashion; some of Tripoli’s people trace their descent to the Roman Empire and retain this most Roman of outfits. Libya Means “Africa”: If the Greeks had conquered the Mediterranean world instead of the Romans, we’d probably call the great southern continent Libya rather than Africa. Greek colonists settled on the “Libyan” continent, as they called it, during the 600’s B.C.E. They built five key city-states in Cyrenaica, the eastern part of modern-day Libya. Phoenician colonists founded Tripoli in the east around the same time. Eventually, the Carthaginians (themselves former Phoenician colonists) brought both into their great North African empire. Then the Romans conquered Carthage in 146 B.C.E. The Romans called the region around Carthage “Africa,” and that eventually replaced “Libya” as the continent’s name. Cyrenaica and Tripolitania–the region around Tripoli–were Roman provinces for six centuries. Some Libyans still claim descent from the Romans and cling to vestiges of Roman culture. That’s why you can see togas on the streets of modern Tripoli. The Arabs and Medieval Islam: During the 600’s C.E., Muslim Arab armies seized North Africa, including Libya. The local Berbers converted to Islam in large numbers, and Arabs began to immigrate, launching the gradual–but still incomplete–blending of the two peoples. Sadly, Libya missed out on many of the glories of Medieval Islamic civilization, thanks to invasion, political disorder, and environmental decline. Red Beard’s Pirates and the Barbary Coast: During the 1400s’ and 1500’s, North Africa’s weak governments and its many cozy ports made it a haven for pirates. The Ottoman Empire took control of Tripoli in 1551, but its rule was light, and the Ottomans encouraged the local pirates. Like England, Spain, and most other naval powers, the Ottomans liked “privateers” who attacked their enemies, and the pirates preyed heavily on European ships and coasts. The best known pirate was Barbarossa, which is Italian for “Red Beard.” The name actually refers to two different men—brothers, one of whom died in 1518 and left his nickname and fearsome reputation to the other. The brothers’ legacy extends all the way to Captain Barbossa from the Pirates of the Caribbean movies. The undead captain takes him name for the historic Barbarossa, though Geoffrey Rush plays an Englishman from roughly 1700 pillaging in the Caribbean, rather than an Ottoman of the 1500’s in the Mediterranean. 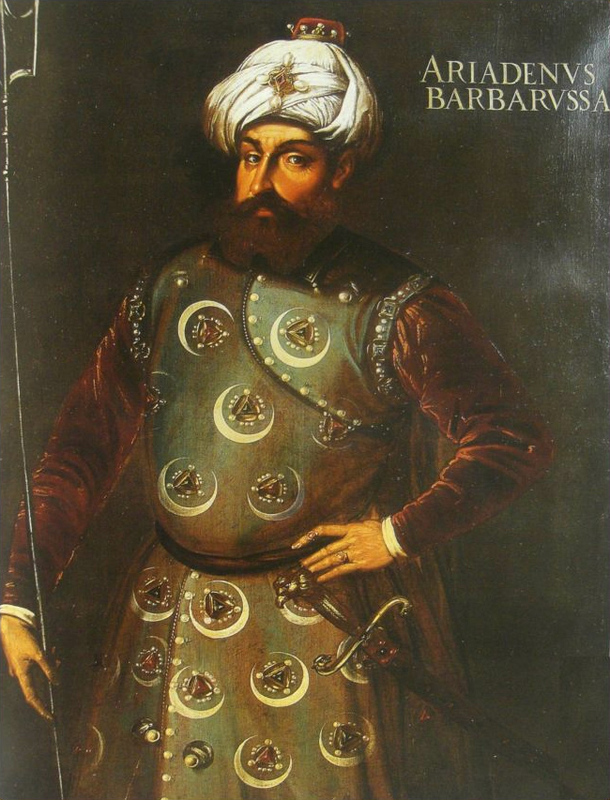 Anyway, the pirates’ land was known as “the Barbary Coast,” named for the Berber inhabitants of Libya and Northwest Africa (not for the Barbarossa brothers). Wars against the New United States: The hymn of the U.S. Marines begins, “From the halls of Montezuma to the shores of Tripoli.” That’s because one of the marines’ first engagements was against the Barbary pirates in Libya, where they destroyed a U.S. frigate being used against other U.S. ships. (Torching our own ship: it doesn’t sound too heroic, but it was actually a risky maneuver skillfully executed.) During the first two decades of the 1800’s, the newborn U.S.A. fought two wars against the Barbary states, over the pirates’ demand for tribute. (The Ottomans still ruled the pirates’ lands, but only nominally.) The Americans won, so U.S. ships operated relatively unhindered in the Mediterranean. The Italians Take Over and Draw the Borders: In 1911, Italy seized Tripolitania and Cyrenaica from the Ottomans, in a vain attempt to catch up to the other European colonial powers, who’d divvied up most of the world. In a sense the Italians created modern Libya by uniting the two conquered regions with Fezzan, the southern desert area, into a single colony within Libya’s modern borders. The Libyans, however, were not grateful and began resisting Italian rule right from the start. This actually isn’t ANYONE’S national costume. Gaddafi’s Libya: Italy lost Libya in World War II. In 1951, the former colony became the United Kingdom of Libya, under an emir who’d aided the British against the Italians. But the kingdom didn’t last long. In 1969, a group of army officers overthrew the monarchy and proclaimed a republic. 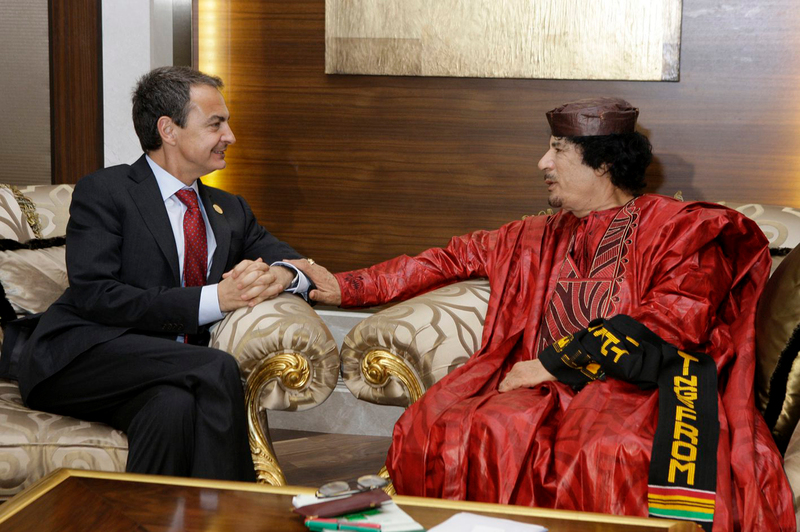 Their leader, Colonel Muammar al-Gaddafi, became head of state. Gaddafi started as a sane and sober fellow, neatly dressed in a military uniform and dedicated to freeing Libya from the grip of Western governments and oil companies. But then the weirdness set in. 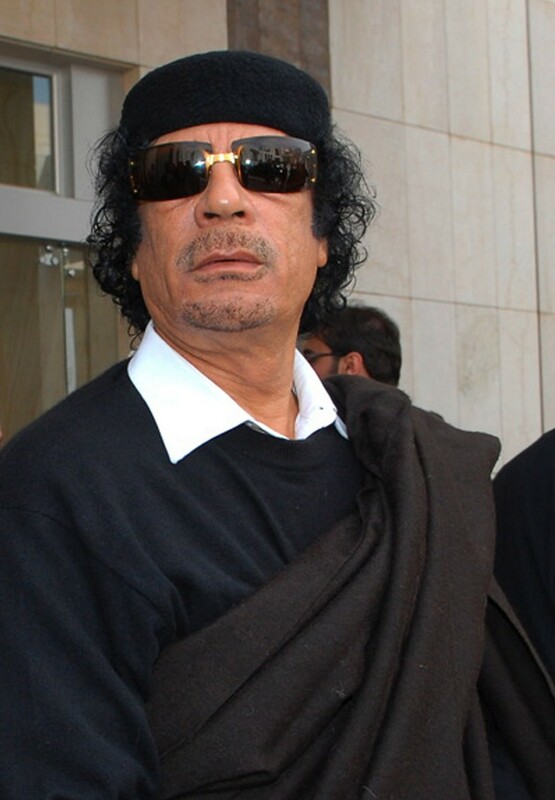 Gaddafi’s more bizarre behavior includes dressing like a cross between a Bedouin and Liberace, traveling with a bodyguard of 40 virgin girls, and launching rambling televised rants that touch on everything from the JFK assassination to the alleged swine flu conspiracy–as well as moving that the U.N. abolish Switzerland. Unfortunately, it’s only funny from a distance. For the Libyans, Gaddafi has been a cruel dictator, and his policies have included brutal suppression of dissent and an attempt to wipe out Berber culture—all fueled by megalomania, paranoia, and probably certifiable insanity. But that may be about to end. Gaddafi toga photo: “Muammar Abu Minyar al-Gaddafi (in Dimashq, Syria), also known as Colonel Gaddafi, leader of Libya since 1969,” by James Gordon through Wikimedia Commons. OMG, Gaddafi proposed that the UN abolish Switzerland? 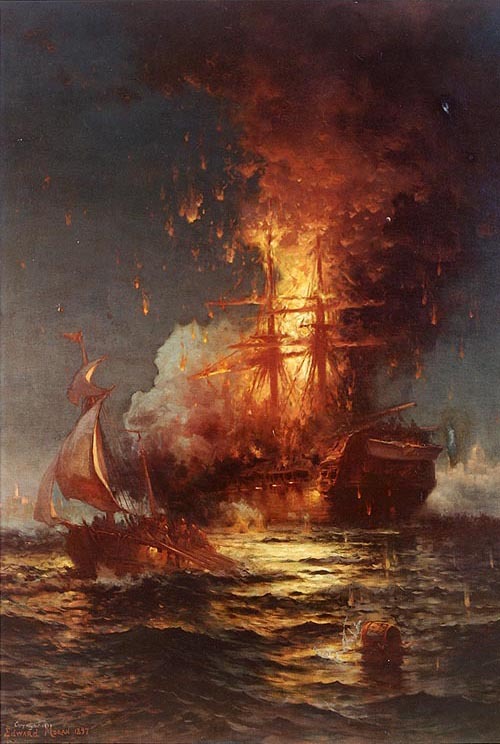 Would also love to hear more about how the US burned its own ship in a war against the Barbary pirates and that was “a risky maneuver skillfully executed”? Thanks for this timely retrospective! Until I read the intriguing facts in your seven bullet points (such as togas in Tripoli! ), the only surprising fact of Libya for me had been the bullets. Thanks, Al! John, in answer to your question, the U.S.S. Philadelphia ran aground while on maneuvers in Tripoli’s harbor. That sounds pretty lame, but apparently the reef in question wasn’t marked on any charts. Anyway, the Tripolitans captured the ship and used it as a stationary gun battery against U.S. ships. So the U.S. sent a force of marines to put the ship out of commission. Ironically, they used a small captured Tripolitan ship to mislead the guards into letting them get close, posing as a local ship in distress. Then they captured the Philadelphia and set it on fire. Britain’s famous Admiral Nelson–the one-armed hero of the Napoleonic wars–described the mission as the “most bold and daring act of the age.” The “special relationship” between Britain and the U.S. at the time involved a lot of shooting and sabre-rattling, as well as British ships impressing (enslaving) American sailors, so Nelson’s praise of an American mission should probably be taken seriously. A side-note: the commander of the marines’ mission was a navy lieutenant named Stephen Decatur. The firing of the Philadelphia made him America’s first bona fide hero since the Revolution. Decatur, Illinois is named for him (along with a lot of other U.S. towns). Agreed, Asya: Berbers are not Arabs. The Berbers had already been in North Africa thousands of years when Jugurtha (one of their kings) fought the Romans, and that was 800 years before the Arabs arrived. In fact, they’d already been in North Africa for thousands of years when the Carthaginians arrived from Phoenicia (which was before Rome was even founded). The Berbers are actually pretty rare in the world, in that they’ve been in their homeland so long no one can name a population that came before. How many nationalities can say that?